The Keweenaw peninsula contains one of the largest and most unique copper deposits in the world. It is the only district where native copper was the primary mineral mined throughout the life spans of the mines. The preserved geologic history consists of rocks from the Precambrian (1.1 billion years) and Pleistocene ( 2 million year) glacial deposits. The Keweenaw peninsula is in Upper Michigan and extends into southern Lake Superior (the world's largest fresh water lake). The peninsula is approximately 150 miles long and 50 miles wide. The Keweenaw fault extends along the length of the peninsula and marks the boundary between the Mid-continent rift and continental rocks. The rift valley was filled with a combination of extrusive volcanic rocks with minor amounts of intrusive igneous rocks and sediments derived from the igneous rocks. The Greenstone flow is one of the largest lava flows in the world. It can be mapped for 90 km on the peninsula and is also found on Isle Royale 90 km northwest on the other side of the rift valley. It has a thickness of up to 400 m with an volume estimated to be between 800 to 1,500 km3 of lava. Other flows on the peninsula can be mapped for lengths up to 160 km. Utilization of the copper from the glacial float as well as shallow mines occurred from at least 6800 years before the present. Native Americans may have mined between 100 and 500 million pounds of copper from deposits on the peninsula and Isle Royale. The fissure veins were the first type of deposit to be exploited by the early prospectors in the 1840's to 1880's. The mines produced large masses of native copper ( up to 520 tons), but were of irregular distribution, were difficult to find, and most did not pay back their investors. The greatest production of copper was from gas pockets in the lavas, interstitial spaces in the breccias developed on the top portions of the flows, and porosity between rock clasts in sedimentary rocks (conglomerates) derived from the volcanics. More than 11 billion pounds of copper have been produced in the district over the 150 years of mining activity. Currently the only mining that is occurring is in the Caledonia mine which is being mined for copper and other mineral specimens. Several mines have tours which give a flavor of the conditions under which the miners lived and worked. Many of the waste rock piles from the mines are being crushed and used as gravel in the local construction industry. The world's best specimens of native copper have been found in the mines in the district. It also has seen the production of silver crystals, copper included calcite crystals, chalcocite, copper arsenides, and secondary copper minerals. Lapidary material found on the peninsula has included datolite, chlorastrolite ( massive pumpellyite - the state gemstone of Michigan), and Lake Superior agates. 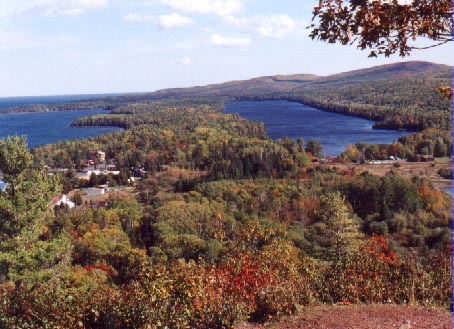 Copper Harbor from Brockway mountain (Copper Harbor and Lake Superior to the left). Lake Fanny Hooe's (right) shape is controlled by the geology of the peninsula. Erosion of softer rocks by the glaciers has resulted in the basins which are now filled by lakes. The more erosion resistant rocks to the right, form ridges throughout the peninsula. This area was one of the first locations on the peninsula to be mined (most unsuccessfully) and was protected by Fort Wilkins (1844-1846, late 1860's - briefly). Lake Superior surrounds the Keweenaw peninsula. 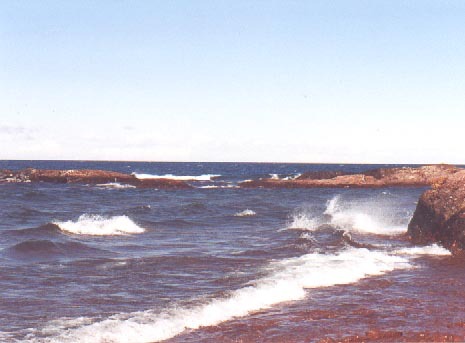 Rock outcrops on the northwest shoreline are composed of the Copper Harbor conglomerate. The Stop numbers in the following text refer to the locations in Bornhorst & Rose's "Self-guided geological field trip to the Keweenaw Peninsula, Michigan".